Hey there! Thanks for dropping by David Stubbings speaks out! Take a look around and grab the RSS feed to stay updated. See you around! 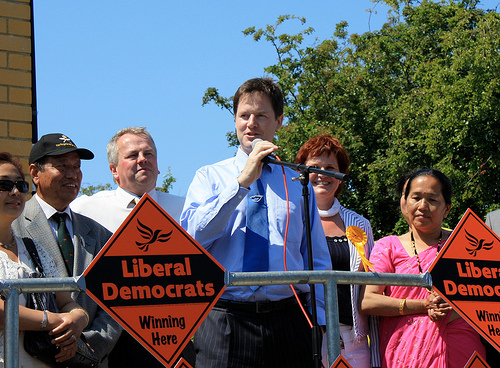 Clegg won this battle, but can he win the war? It’s just over twenty-four hours after the first ever UK’s first ever television debate between those wishing to be our next Prime Minister and everyone is now sitting up and, for the first time in a long while, taking note of the Liberal Democrats. Yesterday’s papers all proclaimed the performance of Nick Clegg during the debate for both what he had to say and the way he said it. The question now is can the party build on this momentum and close the gap on the two parties which have dominated the British political scene for the last 80 years? Mr Clegg’s performance in Manchester has meant that now both parties must look seriously at his party’s policies and scrutinise and question them. Behind Gordon Brown’s love-in with the Lib Dem leader, he and his party must have a close look at Nick Clegg’s manifesto. The polls done in the minutes and hours after the televised debate showed Mr Clegg rocket up the opinion polls with most of them placing him ahead of David Cameron and Gordon Brown in the leaders poll and the Lib Dems closing up on their rivals in the party polls, though not by much. However some polls put the Lib Dems ahead of Labour, but not many. But this could well be a knee-jerk reaction. Despite the performance of Nick Clegg there is still this opinion amongst certain quarters that a Lib Dem vote is a wasted vote, though that opinion is less widespread now. So the new argument is that a vote for the Lib Dems is either a vote to keep Gordon Brown or a vote for a hung parliament and bring the country back into recession. There is a chance that the public can be influenced by these arguments and that in the end people will still either vote Conservative of Labour. Personally I like what I hear from the Liberal Democrats and think, with the help of the television debates, they are being seen as a party that can influence the outcome of a general election. The Lib Dems are the most favoured of the three major parties due to their commitmant to remove students’ tuition fees. Even if they do not get into power, in the event of a hung parliament the Lib Dems will have a crucial role to play with both parties trying to gain Mr Clegg’s support should there be a hung parliament. And although they may have the student vote but do they have enough to gain a larger percentage of the vote overall? That remains debatable and it may have to be more of a long term strategy for them to get a majority government. To win an overall majority a single party needs to get 326 seats in the House of Commons. Although the chances of the Liberal Democrats getting that many seats in Westminster is slim, if they win enough seats they can stop both Labour and the Conservatives from passing the winning post too. Before the election people weren’t sure whether it would be Cameron or Brown who would be the next Prime Minister. Although Clegg is the least likely of the three major political leaders to become PM, he’s got the biggest chance of influencing who does.